Nearly 200 Catholic priests from around New Zealand met in Christchurch from 10 to 14 September. 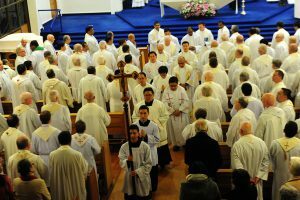 The national assembly of diocesan priests is held every five years. Together with bishops, the priests met to renew their commitment to priesthood and to reflect on their place in this time of unprecedented change in the Church. The two keynote speakers were Canadian priest, Fr James Mallon, Episcopal Vicar for Parish Renewal and Leadership Support for the Archdiocese of Halifax-Yarmouth, Nova Scotia, and Bishop Vincent Long, Bishop of Parramatta, Australia. In his weekly newsletter to his Sacred Heart Cathedral parishioners, Fr James Lyons said, ‘The keynote speakers’ presentations were wonderful and invited us all to look with honesty at how we each regard our place in the community and what God in Jesus might be calling us to become. ‘Fr James Mallon asked the question, “If your church closed tomorrow would anyone who doesn’t go care?” He reminded us that international companies, such as Kodak and Swiss Watches went out of business because they didn’t read the signs of the times and change. The last 20 years have seen incredible change in all aspects of society demanding new models of ministry for the Church and new ways of engaging, with an increasingly secular world. The National Assembly of Priests, Christchurch. Bishop Vincent Long, a former Vietnamese refugee, said that the Church must return to the ‘raw canvas’ of the Gospel and follow more closely the way of Jesus – the way being modelled by Pope Francis – humility, trust, and courage. Bishop Long said, ‘We must not see ourselves as being “apart from” the people but, being “a part of” them.’ This means reaching out to the peripheries and not to look in on ourselves. 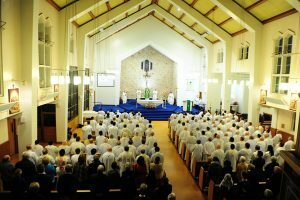 Fr Michael McCabe shared with his parishioners at Our Lady of Kāpiti Parish, that Bishop Long spoke about the Royal Commission of Inquiry in Australia into abuse, which found that the culture within the Church needed to change given the current crisis – the biggest crisis since the Reformation.